What is it that attracts hundreds of thousands of tourists to the Seychelles each year? It could be the pearlescent white beaches and the glistening turquoise sea. Or it could be the luscious jungles that make for exciting wildlife walks. It could also be the charming locals, or even the biodiverse marine life that makes it a haven for snorkelers. Whatever you consider to be your dream holiday, you’ll be sure to find it in Seychelles. 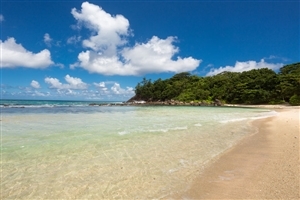 When it comes to beaches in Seychelles, you’re spoilt for choice in this island paradise. But if you have to visit just one, make it Anse Volbert, where you’ll be able to sink your toes into the warm white sand that the tropics are so famous for and soak up the glorious African sunshine. It’s great for watersports too. Once you’ve worked on your tan, venture to the nation’s capital, Victoria. There’s a bustling covered market here, where you can pick up some delicious fresh fruits and vegetables, and souvenirs for friends and family back home. With over 30 years experience in arranging holidays to Seychelles, booking your 2019 or 2020 holiday with Travelbag has never been easier. 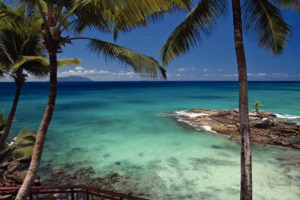 Take a look at our flights to Seychelles from the UK today. 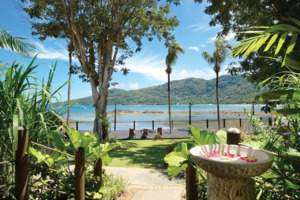 We offer a range of Seychelles hotels to help you find the perfect base for your holiday. Whether you’re after a modest and cheap Seychelles hotel in a comfortable setting, or five-star luxury accommodation, we’ve got you covered. If you’re travelling to Seychelles on a budget, consider the Berjaya Beau Vallon Bay Resort & Casino. 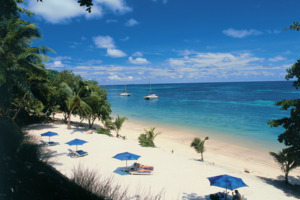 Here you’ll stay on the north coast of the beautiful Mahe Island, with views of the glistening Indian Ocean. A three-star resort, the Berjaya Beau Vallon boasts comfortable guest rooms at a very reasonable price. Looking to stay in one of the best hotels in Seychelles? It has to be the Banyan Tree. Here you’ll be able to relax in comfort of your own private accommodation - which includes a private pool - and sample some delicious local cuisine. Fancy staying in some five-star luxurious accommodation? 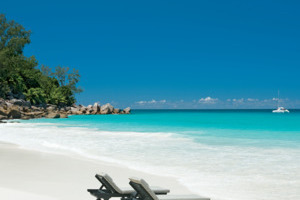 Consider the stunning Hilton Seychelles Northolme Resort & Spa, where you’ll want for nothing in the idyllic setting. Takamaka Bay - Seychelle’s main distillery is a great day out. Here you’ll learn all about the history of rum making in the area, as well as being able to taste lots of produce. Victoria Market - If you fancy a change from lounging about on the beach then head over to Victoria’s covered market. It’s liveliest on a Saturday. Vallee de Mai - At this nature reserve you’ll be able to see one of the only places that the rare Coco de Mer palm tree grows in its natural habitat. La Passe - If you want to experience some authentic Seychellois culture then visit La Passe. This sleepy tropical port features almost no cars, just some little shops and cafes - perfect for strolling through in the afternoon. 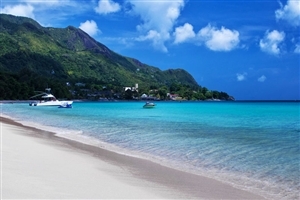 A holiday to Seychelles is one that’s full of culture and natural beauty. Finding the right hotel to go with such an amazing adventure can be a difficult task but with Travelbag, you’ll be able to find the right one for your Seychelles holiday. Here is just a selection of our favourite and cheapest hotels in Seychelles. Please use our search panel above to find your perfect choice. With a privileged location on the north coast of the stunning Mahe Island, Berjaya Beau Vallon Bay is an outstanding Seychelles holiday resort for the whole family to enjoy. 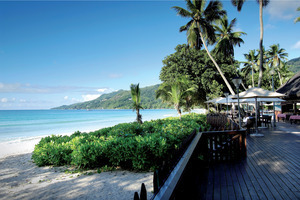 Take advantage of pristine white sand beaches and the crystal clear waters to indulge in a spot of sun-bathing or scuba ... diving, relax with an exotic cocktail beside the beachfront swimming pool or maybe even try your luck in the excellent resort casino, Berjaya Beau Vallon Bay has something for everyone to get excited about. Treat yourself, a loved one or the entire family to an unforgettable Seychelles holiday at the excellent value Coral Strand Hotel. Located on the pristine stretches of Beau Vallon Beach, one of the Seychelles’ most popular beaches, the Coral Strand Hotel offers spacious, comfortable and modern accommodation in a truly ... spectacular exotic setting. Popular with couples and families, as well as returning guests, facilities at Coral Strand Hotel include four restaurants and bars, swimming pools and watersports activities. Whether you’re looking to immerse yourself in the soothing ambiance of the glorious Seychelles on a relaxing vacation or seeking to experience the thrills and excitement of an adventurous, once-in-a-lifetime holiday, the Avani Seychelles Barbarons Resort and Spa is happy to oblige, proving to be a comfortable and stylish haven ... for family adventurers, sojourning romantics and business travellers alike. Boasting an enriched European heritage that seamlessly infuses with contemporary designs, the resort sets the tone for a magical time spent in a scenic oasis like no other, with gorgeous, pristine beaches spread out before you just waiting to be discovered up close or enjoyed from the comfortable confines of one of the lavish accommodations that make up the resort. Spend the day in sea or on land with a variety of excursions, bask upon the beach or simply take in the distinct aspects of the resort, whose many facilities and dining venues are at your disposal, the choice is yours, and no matter what, it’ll prove to be unforgettable. Named after the rare Coco de Mer palm tree, which grows in abundance around the resort, Coco de Mer Hotel & Black Parrot Suites offers tranquil hospitality in a beautiful Seychelles setting. A four-star hotel tucked into 200 acres of lush tropical vegetation on the edge of the Indian Ocean, ... Coco de Mer Hotel & Black Parrot Suites complements its intimate location with comfortable, spacious guestrooms, tempting culinary options and generous amenities. Overlooking azure waters and nestled by lush tropical gardens lies the tranquil oasis that is DoubleTree by Hilton Seychelles Allamanda Resort & Spa. Located in the south of Mahé, this four-star resort is only a 20 minute scenic journey from the Pointe Larue International airport. Enjoy the warm hospitality and ... special touches like a freshly baked cookie to welcome you on arrival. Embrace island living from the moment you step into your room with contemporary decor and stunning ocean views. Doubletree by Hilton offers fantastic facilities with friendly service that make this the perfect escape for couples, families and groups. The magnificent Kempinski Seychelles Resort is a heavenly destination for those looking to immerse themselves in the exotic landscape of the Seychelles, from the magnificent coral islands and the pristine beaches to the lush nature reserves and world heritage sites. The lavish retreat is decorated in such a way to ... emphasise the surrounding splendour, with international level luxuries and furnishings on offer that set the tone for a magnificent holiday experience. The resort also presents a wide variety of leisure activities and soothing facilities for guests to utilise along with a number of dining venues and lounging spots to accompany each of the elegantly designed guestrooms and suites that serve as the perfect havens filled with style, space and privacy to ensure a memorable time for any and all travellers. Set on the western tip of the Seychelles’ beautiful Beau Vallon Bay, Le Meridien Fisherman’s Cove enjoys a wonderful location within its own tropical garden. Comprising of 68 smartly-appointed guestrooms and suites spread across the picturesque grounds, Le Meridien Fisherman’s Cove delights with its generous facilities, including the indulgent Zen ... Spa and two fabulous a la carte restaurant serving international and local favourites. As the name suggests, Le Meridien Fisherman’s Cove also offers the chance for guests to get out into the water and discover more about the incredible marine life that surrounds the resort. Kissed by the breathtaking cobalt waters of Port Launay National Marine Park, the five-star Constance Ephélia is an elegant luxury Seychelles holiday resort. Stay at Constance Ephelia Resort and you’ll reside in elegantly-appointed ocean view suites and villas, be lavished with delicious gourmet cuisine from five restaurants and be presented ... with an array of enticing activities. Constance Ephélia’s superb location makes it a particularly ideal choice for keen divers and snorkelers. 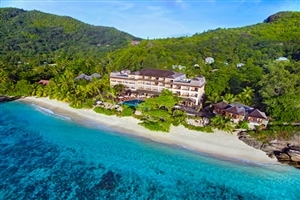 Located on the magical Silhouette Island, the Hilton Seychelles Labriz Resort & Spa revels in its idyllic setting, sharing the island with various scenes of splendour ranging from majestic mountains adorned in shades of green to the crystal clear waters that lap at the pristine white sands of the local ... beaches. Guests can immerse themselves in the wondrous surroundings and discover the numerous vantage points around the island or simply sit back and enjoy the modern comforts and luxuries of the resort, from the soothing spa treatments that are sure to impress romantic couples to the more adventurous activities found along the beach that the whole family can enjoy. Each of the lavishly fitted villas that are dotted around the resort serve as unique havens where guests can embrace unmatched levels of privacy that each and every guest is sure to appreciate as they create their own unforgettable memories. 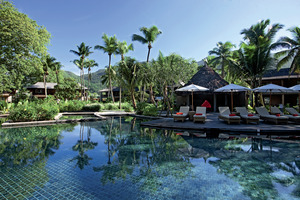 Escape to the exotic tropical island of Seychelles with a blissful stay in the Hilton Seychelles Northolme Resort & Spa. 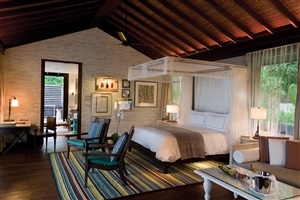 Ideally located on the picturesque island of Mahe, an emerald jewel in the cloak of the Indian Ocean, Hilton Seychelles Northolme Resort & Spa comprises of private villas nestled into ... the hillside or above the shimmering waters on stilts. Book a stay at Hilton Seychelles Northolme Resort & Spa and you’ll feast on delectable cuisine prepared in two restaurants and indulge in the pampering treatments of the Duniye Spa. With its seamless blend of luxurious amenities and breathtaking natural splendour, Constance Lemuria is a superb five-star Seychelles holiday resort. Experience the highest standard of quality and service as you admire your elegantly appointed suite or villa, cast your eye over a menu of tempting culinary delights and consider which ... of the plentiful activities to partake in first. 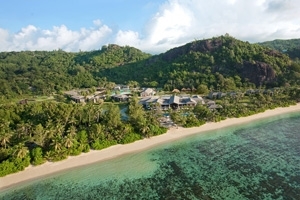 Ideal for a golfing holiday, Constance Lemuria also features its award-winning Lemuria 18-hole golf course, which takes in some of the Seychelles’ most remarkable scenery. Relax in five star luxury with a break at the Bayan Tree Seychelles, which is one of the premier destinations for those paying a visit to the islands in the Indian Ocean. Offering a range of stylish accommodation in picturesque surroundings looking out across the ocean, the resort is also ... home to a wide selection of impressive dining options and all the facilities you would come to expect from a luxury resort; ensuring a holiday experience that will live long in the memory. Surrounded by acres upon acres of gorgeous tropical splendour, pearlescent white sands and the ebbing, azure waters found in the Southwest Mahé, the Four Seasons Resort Seychelles makes for an exotic haven that seamlessly combines natural beauty with the high levels of service and standards that have become Four Seasons ... hallmarks to entice even the most discerning of adventurers. From the secluded villas nestled amongst the emerald hues of Petite Anse to the soothing ambiance that permeates throughout the hilltop spa, guests are in for a sensory experience like no other, and with so many lavishly designed accommodations to choose from, facilities to utilise and in-house dining venues to experience, this is one Seychelles escape you won’t ever want to leave.